Students from a Dickinson College geophysics class survey the Mt. Tabor Church Cemetery for unmarked graves. Photo by Carl Socolow '77. 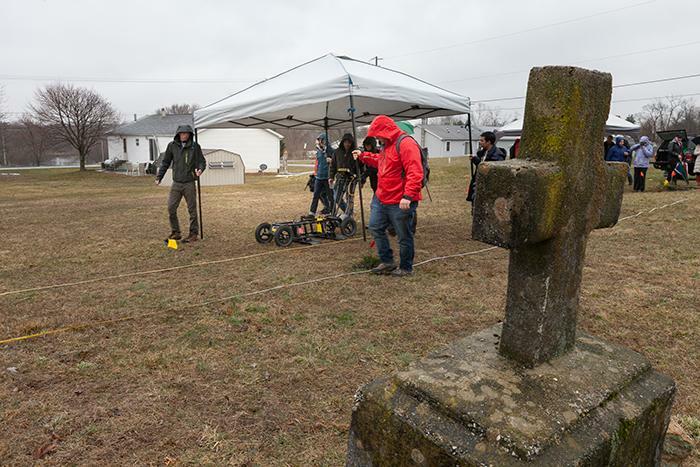 We join a geophysics class as they search for unmarked gravesites with ground-penetrating radar. Then, we unveil the answer to last month’s brain teaser and test your sleuthing skills with a trivia question from Associate Professor of Mathematics Jeff Forrester. Know the answer? Email TheGood@dickinson.edu for a chance to win Dickinson swag. And, President Margee Ensign joins us to discuss mermaids and Day of Giving. Brain Teaser: "Find the Connection"
The Good is produced by Craig Layne and Christine Baksi in association with Dickinson College's Office of Marketing & Communications. Craig Layne is the host. Subscribe to The Good on Apple Podcasts, Spotify and Stitcher. Find all of The Good's episodes on the podcast homepage.